The highway sits on the border between Kenosha and Racine counties, and has taken on new prominence with the advent of nearby Foxconn. The vote in one committee—Public Works—was initially tied. Then County Board Chairman Dan Esposito stepped in to break it by voting to support the plan. Even though he isn’t a member of the committee, Esposito could vote under County Board rules because the committee is short a member. Supervisor Michael Skalitzky, who represents some of the affected landowners, wanted to delay the vote until Racine County supervisors weighed in on land they control on the north side of the highway. 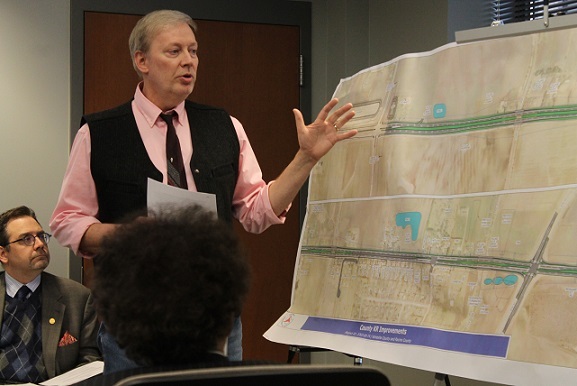 Others felt nothing would be gained by a delay because planners don’t anticipate changing the amount of land that’ll be required on the Kenosha County side of the highway. The full Kenosha County Board is expected to vote next week. A final decision by the Racine County Board is several weeks off. Kenosha County Public Works Director Ray Arbet said numerous design changes have been made in recent days in a bid to accommodate the wishes of the affected landowners. An expansion of County “KR” from two to six lanes between I-94 and Highway “H” is expected to be completed this year. Expanding “KR” from two to four lanes between “H” and Old Green Bay Rd is what’s currently on the table.